Football is the world’s truly global game but where do passions run highest? Which clubs inspire not just the most support, per se, but the biggest share of the local (domestic) support? 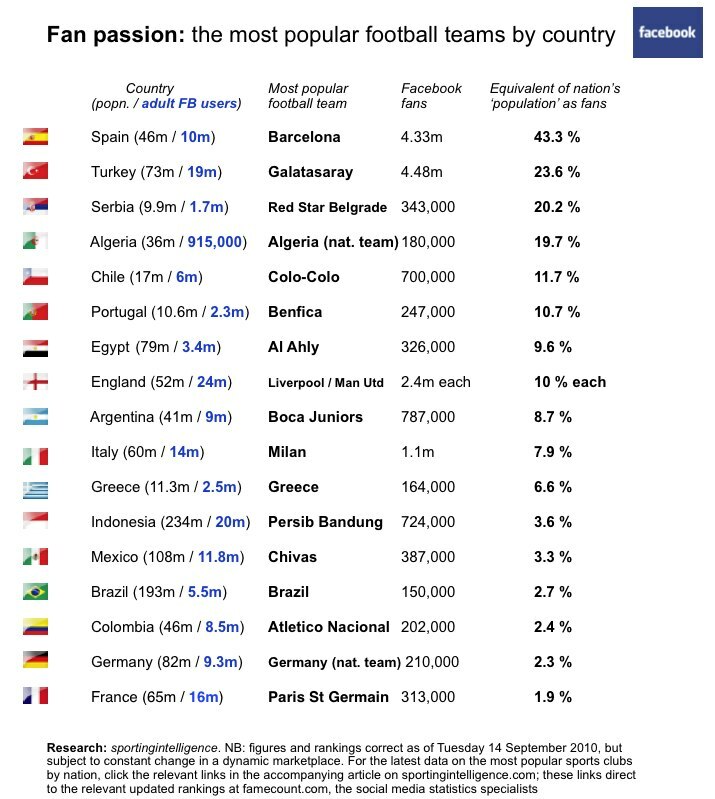 According to new research by sportingintelligence, the five football teams with the biggest share of their populations behind them are Barcelona (Spain), Galatasaray (Turkey), Red Star Belgrade (Serbia), the Algerian national team (Algeria), and Colo-Colo (Chile). See table below for full details. This latest analysis, based on Facebook ‘fans’ of teams – Facebook being, in effect, the world’s largest data pool of likes and dislikes, with 500m users – looks beyond sheer numbers of fans per team. We first looked at sports teams’ overall popularity on Facebook at the start of August. That research is linked here, and Galatasaray of Turkey came out on top. Note that this market is dynamic and huge changes can and do occur over short periods. Regularly updated figures on the world’s most popular sports teams on Facebook (and other social networks) can be found here at famecount.com, the social media statistics specialists (tallies updated daily). Today’s research considers relative strength of support, by considering a nation’s ‘Facebook population’ (adult users in that country), and a team’s fans on Facebook, to produce a “fan passion” percentage. Spain has 10m Facebook users aged 18-plus, for example, and Barcelona are Spain’s most popular sports team on Facebook, with 4.33m fans, giving a whopping “fan passion” rating of 43.3 per cent. Of course not all Barca’s fans are based in Spain, but many of them, almost certainly a sizeable majority, will be. In second place in the fan passion rankings are Galatasaray, with the most absolute fans (for now at least), 4.48m, against an adult “Facebook population” in Turkey of 19m, for a “fan passion” score of 23.6 per cent. We know a majority of Galatasaray’s Facebook fans are inside Turkey (62 per cent) because the club’s web maestros tell us so today in an interview. As our detailed table below shows, the next best supported teams, relatively, are Red Star (20.2 per cent), then Algeria (19.7 per cent), and Colo-Colo (11.7 per cent). Passions also run high at Benfica in Portugal, Al Ahly in Egypt and at Liverpool and Manchester United in England. The single most popular football team from a variety of nations is considered. Elsewhere today we reveal how United are about to usurp Liverpool as the Premier League’s most popular club on Facebook, and we also reveal the most popular sports and teams in nations where a football team is not at No1.